The Lincoln Motor Car Heritage Museum building and exhibits are dedicated exclusively to highlighting and displaying significant examples of the nearly 100 year history of the Lincoln Motor Company. One million, five hundred thousand dollars is required to provide a significant endowment to assure the operation, maintenance and permanence of the facility and associated programs. In addition, funding is needed to refine and complete the exhibits. 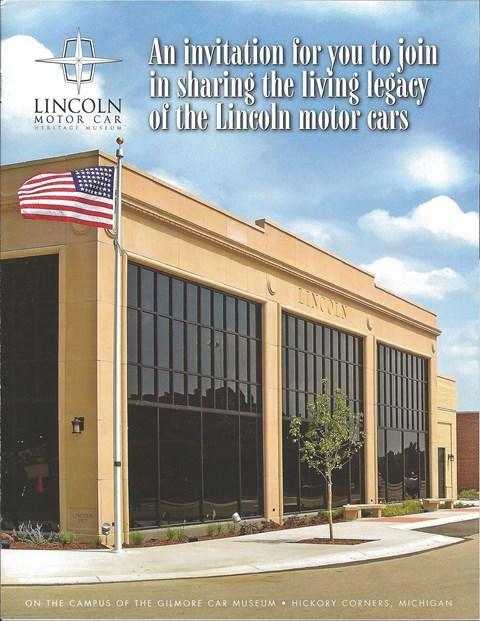 The Lincoln Motor Car Heritage Museum is a place of education, fascination and inspiration. It can also be a place of lasting legacy for you. There are a variety of naming, memorial or commemorative opportunities available. Please join your friends and supporters of the Lincoln automotive heritage in making a generous gift for the purpose of sustaining and improving a museum where we may share with the public the history of the Lincoln brand. Contributions to the Lincoln Motor Car Foundation are welcome as a one-time gift, a pledge payable over five years, appreciated securities or as part of your estate planning. The gifts can be made in your name, in commemoration of someone that you’d like to honor or as a memorial to a loved one or friend. Appropriate recognition of your gift will be made at the museum site. Many special naming opportunities are available or one that particularly appeals to you can be created. The Lincoln Motor Car Heritage Museum & Research Foundation, Inc. (LMCF) is a 501(c)(3) non-profit public charity, ID # 38-3500541. As such, all or part of your gift may be tax deductible as a charitable contribution, or if you are 70 ½, an IRA RMD gift may avoid tax. Please check with your tax advisor. Mail your personal check to the LMCF. Fill out the form at the bottom of this page to donate to the LMCF by using PayPal, or your debit or credit card. directly from your Individual Retirement Account to the LMCF. Transfer your securities (stocks, bonds, etc.) directly from your financial institution to the LMCF. For information on potential tax advantages and/or how to accomplish a securities transfer, please send us a note using Contact Us. about including a bequest to the LMCF in your estate plans and becoming a life member of the Lincoln Legacy Society. Donors who have an Individual Retirement Account (IRA) and are 70 ½ or older may wish to consider having their financial institution make a Qualified Charitable Distribution (QCD) from their IRA directly to the LMCF. The donation counts toward the donor’s annual Required Minimum Distribution (RMD) and may avoid being taxed as income. This is especially beneficial for those who are not able to itemize their charitable contributions and it achieves the same tax objective. Please check with your tax advisor. These Donor Boards, presently displayed at the Lincoln Motor Car Heritage Museum, will be updated in 2019. Please make your check payable to “Lincoln Motor Car Foundation”, indicate on the check, or on a separate note, your choice(s) from “Naming Opportunities” or “Other Gift Opportunities” (see lists below), enter the associated dollar amount(s) for your selection(s), and mail it to the address below. Please have your financial institution make their check payable to “Lincoln Motor Car Foundation”, indicate on the check “For Benefit Of / FBO [your name]” and have the financial institution mail it to the address below. Please send a response to “Contact Us” telling us to expect a check from your financial institution and describing your choice(s) from “Naming Opportunities” or “Other Gift Opportunities” (see lists below), and include the associated dollar amount(s). For “Naming Opportunities” please provide the proposed text that you wish to have on the item(s) you chose and provide your contact information (e-mail and/or phone number) so that we may contact you if we have any questions or issues (or, if you would like suggestions) regarding the text. There are several methods of giving. Your gift in any of the following forms will be sincerely appreciated and carefully utilized. Gifts of $1,000 or more also establish the donor(s) as a Life Member of the Lincoln Motor Car Foundation. Individuals with LMCF Life Membership Cards are entitled to free admission into the Gilmore Car Museum complex during normal hours of operation and are eligible for the Ford Motor Company X-Plan, a partner discount program for new Ford and Lincoln vehicles. Please note that all choices listed above are mutually exclusive for each gift. Endowment Fund – At your discretion – Endowment Fund investment income is exclusively used to help support and sustain the operation and maintenance of the Lincoln Motor Car Heritage Museum. NOTE: For flagstones and bricks – we will contact you to establish the desired text that will be used for recognition. By clicking the 'Process payment' button below, the form will be redirected to PayPal for payment processing. You can pay using your Debit or Credit Card, or with your PayPal account. Please note that your form submission is only valid after you have made your payment through the PayPal interface.